Press the U button on the CM-530 to open the bar. Press the D button on the CM-530 to lower the bar. Press the U button on the CM-530 to increase the gauge's speed. The mouth opens when the front sensor detects something, and close when nothing is detected. It will open its mouth when it detects something. A melody will activate if nothing is detected for 10 seconds. 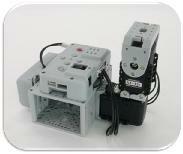 Press the U button on the CM-530 to move the tilt actuator (Up, Down) up. Press the D button on the CM-530 to move the tilt actuator (Up, Down) down. Press the R button on the CM-530 to turn the pan actuator (Sideways) right. Press the L button on the CM-530 to turn the pan actuator (Sideways) left. - Algorithm Control the Dynamixel's position using the IR Sensor and Dynamixel's load value. When an object is detected, the parking gate opens perpendicularly. When an object is detected and the bar is pushed, the parking gate opens horizontally. When an object is not detected, the parking gate closes. - Algorithm Use the CM-530's buttons to set the mode and use the buttons and sensor value to control the rotation direction. Press the U button together with the START button on the CM-530 to change to CONTROL mode. Press the D button together with the START button on the CM-530 to change to FREE mode. When you press the L button in CONTROL mode, it moves forward. The R button moves backward, U button moves rights, and the D button moves left. A melody will play each time it moves. When front sensor detects an object in FREE mode, it will turn right. When the lower sensor detects something, it will avoid the edge and turn right. - Algorithm Control the Dynamixel position using the number of times the MIC detects a sound. The robot will standby with its arm open. The robot the number of time it detects a sound. The robot moves sideways continuously and watches for objects. 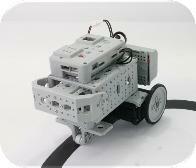 The robot follows the direction in which an object is detected then attacks when both sensors detect an object. - Algorithm Control the Dynamixel position using the distance detected by the sensor. The bar moves depending on the distance detected by the sensor. - Algorithm Control the line tracer using the sensor's detection value. The robot traces the black line. 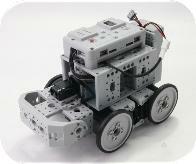 - Algorithm Control various motions using the IR Sensor's value. Place an object in the robot's path and start your robot. Checks whether the robot avoids obstacles while walking.